Daughter decided that she would be chief breakfast cook for Father's Day. She wanted to surprise daddy with crepes. 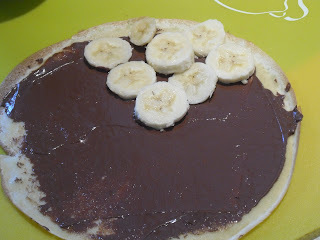 She had seen at the local mall where they make banana nutella crepes and sell them for a seeming huge amount of money. She felt would could do better. 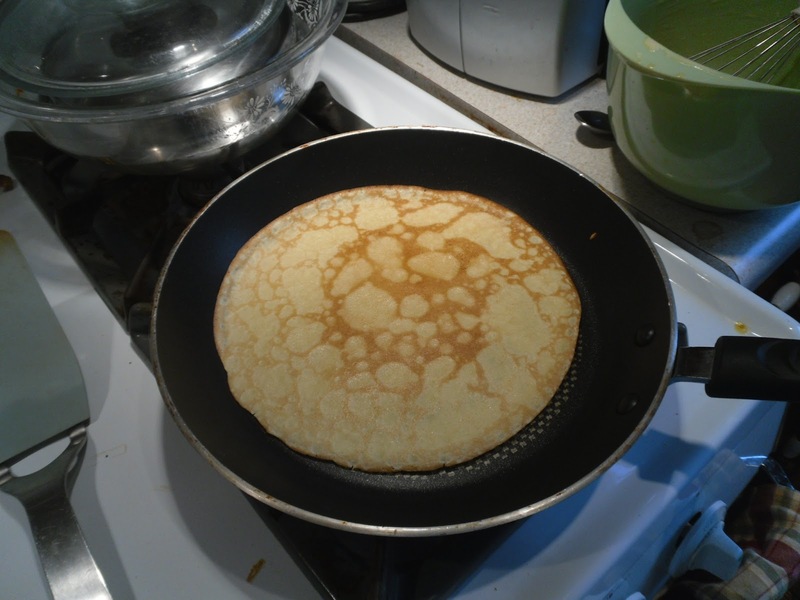 Crepe batter is very easy to prepare.Our recipe is from the 25th Anniversary edition of the Five Roses Flour Cookbook. Combine flour, sugar and salt, in a small bowl, combine eggs, milk and melted butter. Pour all at once in dry ingredients Beat until mixture is smooth. Cover and let stand about 2 hours. Brush frying pan with melted butter and heat. Pour a small amount of batter in pan and turn pan quickly so that batter covers bottom of pan completely. Cook until undersurface is golden brown, about 1 minutes. Turn and brown other side, about 1 minute. Serve immediately. I used a 1/4 cup batter per crepe. 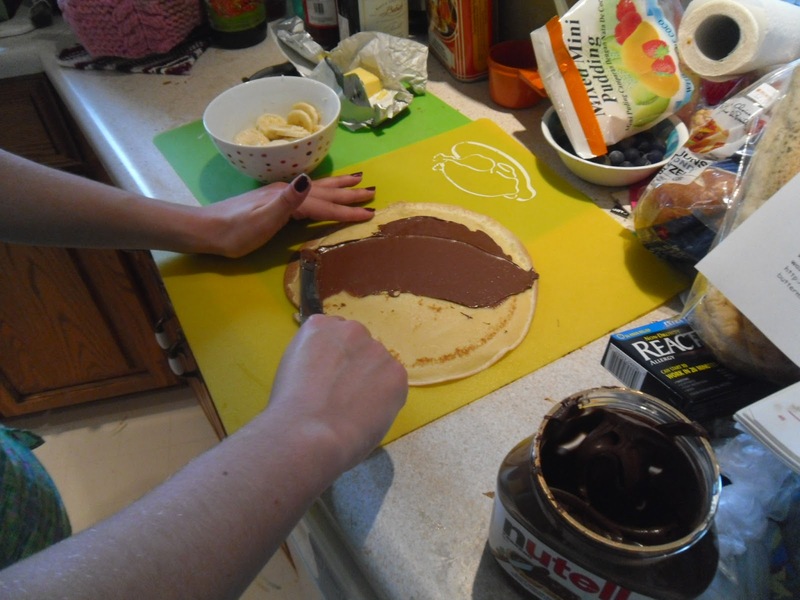 Note: if required, these pancakes may be prepared ahead of time Pile cooled pancakes, separating pancakes with sheets of wax paper. Wrap in aluminum foil and place in refrigerator or freezer. 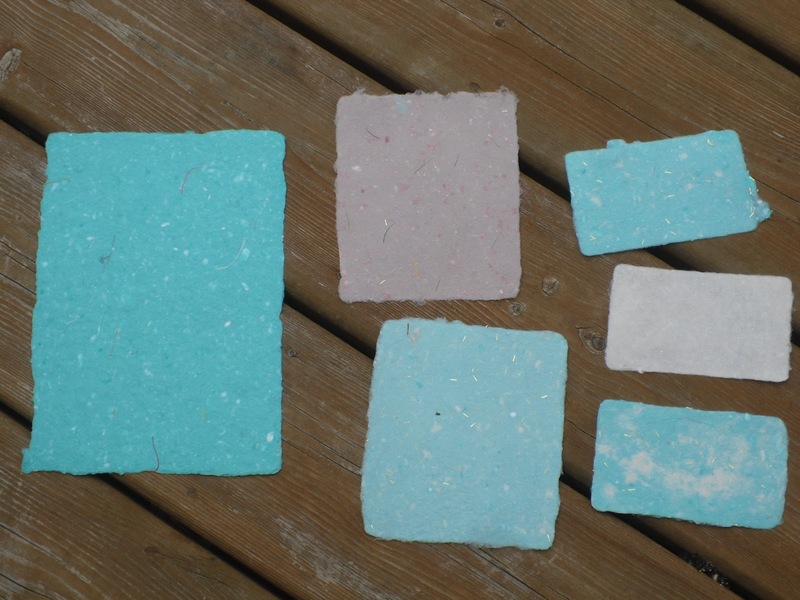 Before using, thaw pancakes without unwarpping. 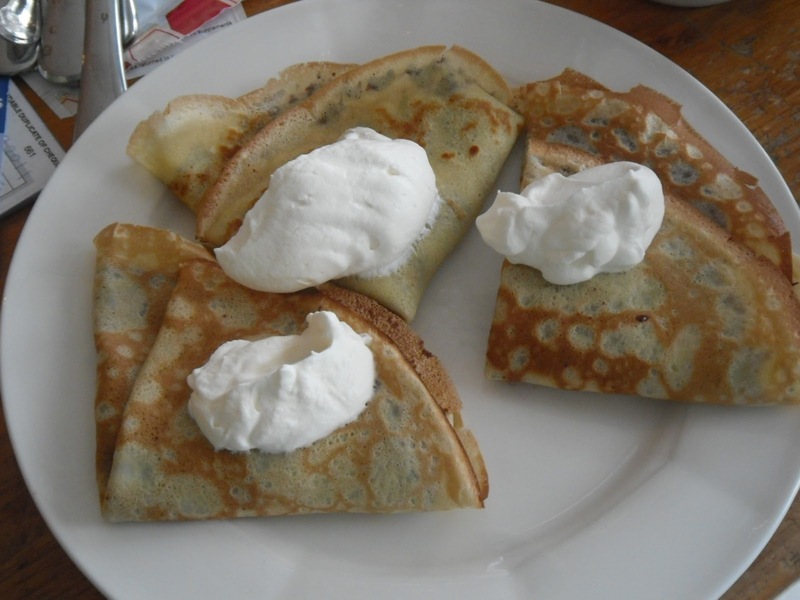 Fold in quarters and top with a good dollop of whipped cream. Three is a bit much for one serving, two would have been quite sufficient. Though being a good mother, I ate all three. For more foodie fun, be sure to visit Beth Fish Reads for her Weekend Cooking post. You are invited to join in the fun by adding a link to your recent food related post. For additional information about this program, read my introductory post. I am definitely in the home stretch. Three motifs completed in row 14. 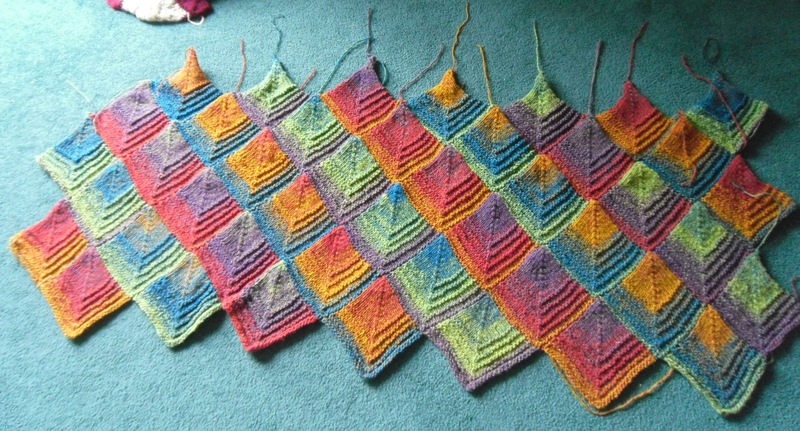 This project has 15 rows, leaving 12 motifs to complete. Have you heard of the Hyperbolic Crochet Coral Reef project. Hundreds of crocheters have created the most amazing replicas of coral. Having been a scuba diver in my earlier years, I can attest that these are quite lifelike. This second video shows very clearly how a piece grows from it's simple centre till completion. I'll be back next weeks with my finishing photos of my mosaic afghan. 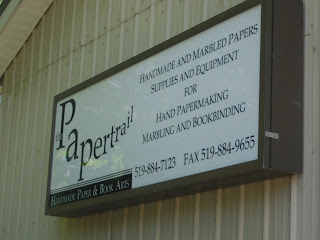 Sherrie at Just Books has been a busy bee. Well, she has been hand quilting her 'Bee' quilt. 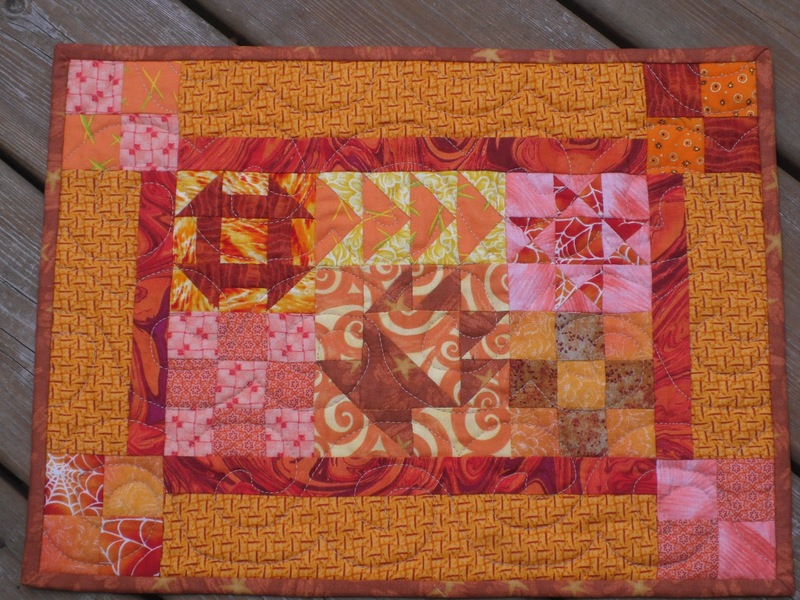 The hand quilting is a perfect fit for the them. IN both Canada and the United States, we are moving quickly toward our National Holidays, July 1 for Canada and July 4 for the USA. Visit at Lit and Laundry for some lovel Patriotic projects. Please leave a comment wih a link to your Patriotic projects. Hiding in plain sight. In my opinion, that's what clowns do. All that overt make-up and distracting clothing, but what are they hiding or hiding from. Eight year old Tad really didn't care what was behind the make-up, he just knew he wasn't going anywhere near the clown that had been hired to entertain at his birthday party. When Tad looked at the clown all he saw was a horrid gray-green aura, the worst possible color. Every person that Tad looked at had an aura, most of them benign. After the birthday party, Tad started having gruesome dreams. For the next few weeks, he dreamed of Pogo the Clown committing the most evil acts. 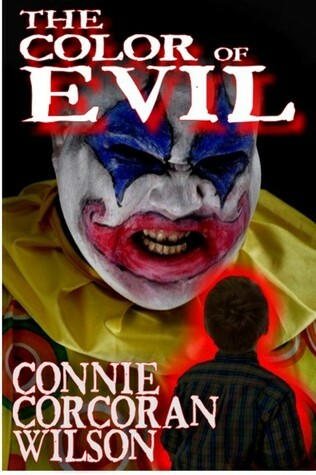 Once the clown is arrested, Tad's dreams stopped, but the young boy was left in an almost catatonic state. We next meet Tad, eight years later, and he is a seemingly well adjusted young man, a junior in high school. He has continued to see aura, but he doesn't tell anyone about them. He has found ways to live with what he knows about people. At least that is the case until he meets and befriends Jenny. When I read a horror story, I don't want to set it down until I turn the final page, and that is exactly what I did with this one. By the time I reached the middle of the book, I knew I wouldn't sleep until I found out 'what happened'. For the first few chapters I was distracted by the straight forward story telling and the repetition of some plot facts. As the story continued and the story intensified, I found that those very same techniques kept me from getting too wound up. The repetitions of the mundane parts of Tad's daily life were very reassuring that life was good and that he was safe from the guys with the 'bad' auras. Each time I felt that I had a grip on the gruesome events, then author Connie Corcoran Wilson would throw in a twist which would put me on edge once again. When I was one chapter from the end of the book, I thought everything was wound up and I would sleep fine, but then she used that final chapter to present those 'loose ends' that I had conveniently pushed to the side. As I read those final paragraphs, I was once again forced to consider the evil and discomfort associated with those horrible colours. Thanks to Virtual Author Book Tours for my review copy. Visit their website for more stops on the tour, including interviews and guest posts with author Connie Corcoran Wilson, and a several book give aways. Be sure to check the right side bar of the SYNC page to sign-up for weekly messages (text or email) to be notified when the next title is available for download. I am trying hard to be focused and work on the Mosaic afghan every day. I am aiming to complete three squares a day in order to have it finished in time to pack it and take it as a gift for my friend. I don't want to arrive at the destination with squares yet to knit or with hundreds of yarn ends yet to be darned. Last week I did quite well and am not starting row 9 of 15. Unfortunately I have done something to my camera and the pictures don't look quite right. I am hoping that it is a dirty lens and that I can clean it. In the meantime, I keep knitting and knitting and knitting. I will have to take a bit of a break and sew up a few pillowcases to be used as father's day gifts. I finally installed the EQ6 (Electric Quilt) software on my laptop. It's been so long since I used it last, that I have mostly forgotten how to use it. After vacation I will have to go through the lessons in the book and refresh. Then will decide whether to upgrade to EQ7. It's good and useful software, but I didn't really miss it for the last two years when it wasn't installed on my desktop computer. Do you EQ? Do you use this software often enough for purchase the upgrades or do you make do. To view two lovely cross stitch projects, pop in for a visit at Lit and Laundry. 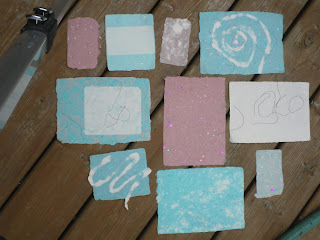 A week ago, daughter and I spent the day with a friend making paper. 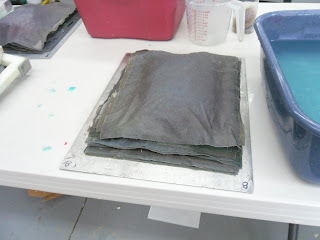 The details are found in my post titled: "Making Paper - a foil to the Ereader". What I forgot to write about was the wonderful lunch we had during our break. New Dundee is not a large place, but it does have at least two good places to eat. Wanting to keep it quickish, we decided to visit the Dundee Diner on Queen Street. Daughter selected the huge dish of poutine. What, you don't know what poutine is. 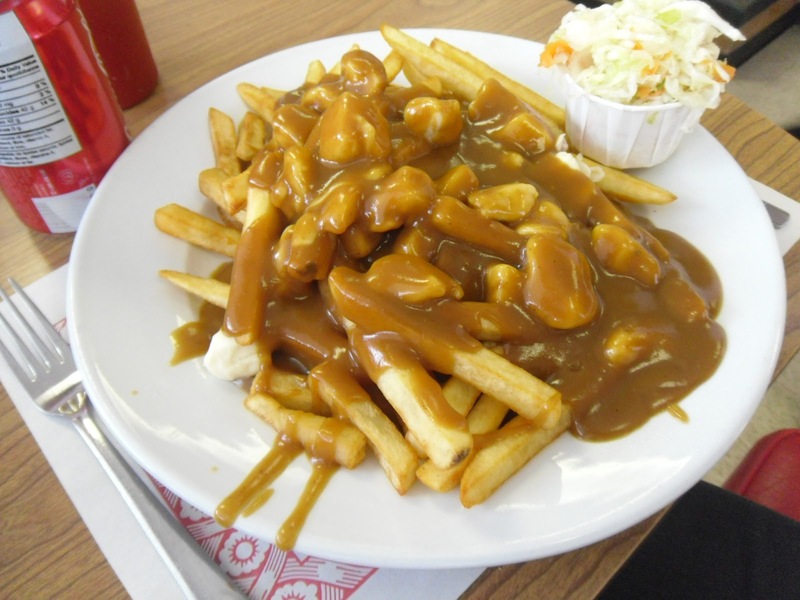 It's a French Canadian dish that starts with a layer of fresh french fries, generously sprinkled with curd cheese and then smothered in a thick gravy. This one had a secret bottom layer of a thick slice of bread topped by a giant, grilled hamburger patty. Daughter made a valiant attempt, but only was able to finish about 2/3 of the dish. 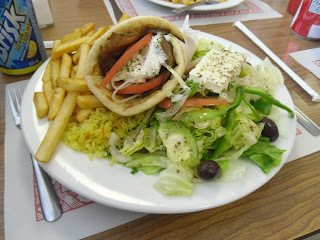 I opted for the souvlaki in a pita dish with Greek salad, fries and rice. I would have been fine with just the souvlaki, but I really did want to include salad in my lunch. The Dundee Diner is definitely on my "re-visit" list. They are have a cooler featuring the most amazing looking desserts. We were far too stuffed to even consider sweets. Next time, we are starting with dessert. On Monday evening was potluck dinner at my local quilt guild. 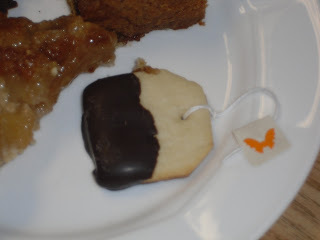 One of the desserts was this wonderful tea bag cookie. It was not a sweet sugar cookie as we all suspected. I don't have the recipe for this one, as the baker would not own up to making them. They were a huge hit. A quick search of the Internet turned up many recipes. I have included the link to a gluten and dairy free version that I found at PaleoSpirit.com. I happen to have all the ingredients and think they will be perfect for the Bridal tea party that I am planning for my neighbour's eldest daughter. I will be adding some sprinkles after dipping in chocolate. I wanted to take a dish to the pot luck that was dairy free, but I also wanted to be considerate of a friend who must refrain from gluten. 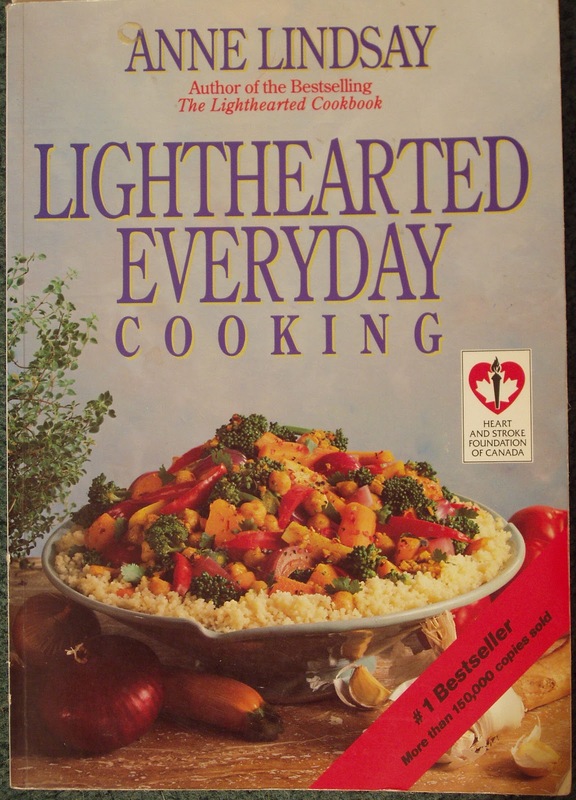 A friend gave me several copies of 'healthy' recipes and one of them would be perfect. Vegan Sweet Potato Picnic Salad. Place sweet potatoes in a large pot and cover with cold water. Bring to a boil, reduce heat and simmer until tender about 7 minutes. Drain and allow to cool. Add apples, celery, scallions, raisins and parsley. 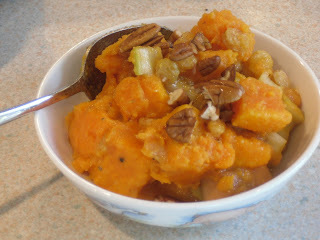 sweet potatoes and toss gently. * I didn't have any scallions nor parsley. If I were making this for at home, I would have added half of a diced Vidella (sweet) onion. I did sprinkle some bits of pecan on top when I had a dish the next day. To mix the oil, vinegar, and spices, I put them in a cup with tight fitting lid and shake until well mixed. This tastes best when allowed to sit for a few hours before serving so the flavours can mingle. Thanks to Anita for sharing the recipe, sorry but I don't know which publication it is from. 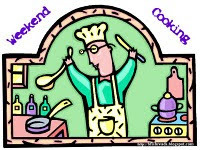 For lots more foodie fun, be sure to visit Beth Fish Reads for her Weekend Cooking post. You are invited to add a link to your recent foodie post. Avice Brenner Cho is a member of the small human population that lives on a remote planet which is home to the Ariekei. For years, the humans and the Ariekei have had difficulties communicating with each other. Avice can understand some of what they say, but has not ability to speak their language. When she is young, she is invited to provide the material for the development of a simile that is of great importance to the Ariekei. This is her closest contact with her 'neighbours', though it brings her no closer to understanding them. After years away, working as flight crew on a space going ship, she returns home with her linguist husband Scile. While the two of them are drifting further apart in their relationship, he draws closer to an understanding of the unique language. I read this book, or rather I read half of it, as it was a selection for my local book club. I found it very un-readable. There were far too many words that were not defined, but rather their meanings obliquely implied. 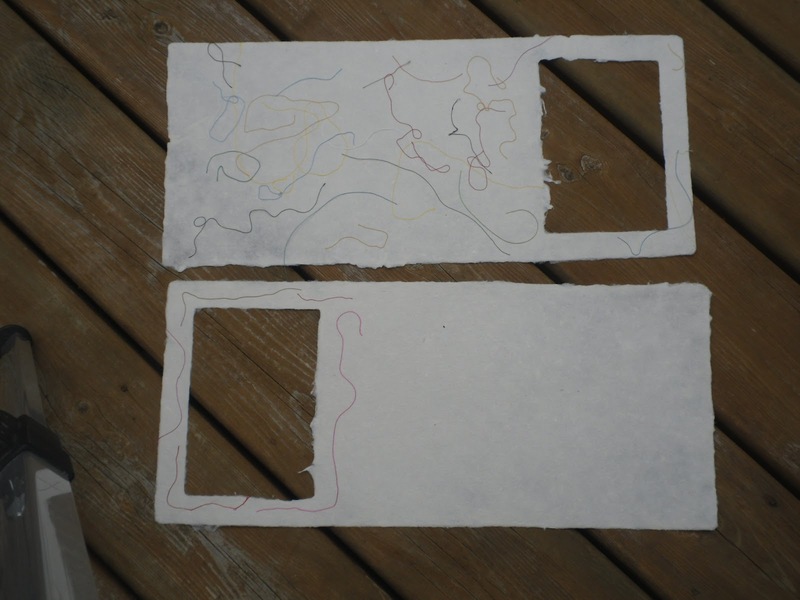 There were also lines and paragraphs from which I could discern no meaning, such as the following, "Immerse, into the immer, where the translations of their ungainly lines have purpose, and they're gestalts of which we're parts, each of us a function." 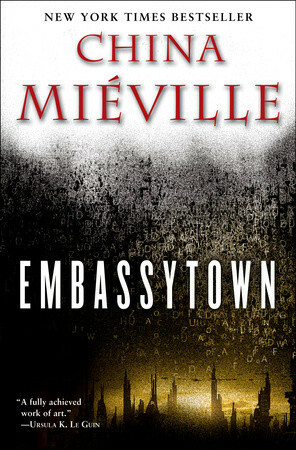 I do understand that language was a major barrier between the two dominant societies living on the planet, and I could certainly imagine their frustration of not being able to understand each other, but by making it so difficult for the reader to understand, Mr. Mieville totally lost me. I did enjoy the story that was unfolding, but it was far to difficult to decode to be enjoyable. I will admit that I was brought to tears by my frustration. I have two honors degrees from a leading university, have read thousands of books, however, this book will not be among those that I have finished. We had a lively discussion at our book club meeting and the language was a challenge to most of us. I was told that it did become easier to understand once you got past the middle of the book (which is where I stopped reading). I did enjoy the plot line that dealt with the impact of the humans and their ability to utter lies. This book brought to mind a Star Trek Next Generation episode, "Darmok", where Picard was transported to a planet along with the captain of another ship. The two species had been unable to understand each others' languages, and were forced to learn to communicate so that they could survive the challenges of the planet. 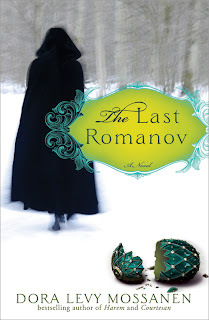 While I did not finish the book and found the language un-readable, there is a good story hidden inside. If you have more patience than I, and you aren't bothered by loosely defined words, then give this book a chance, it shows a good understanding of developing communications and the impact of one society on another. 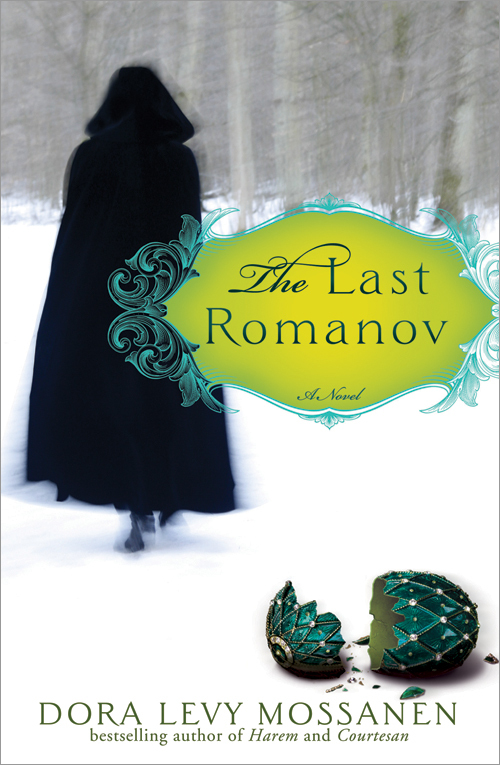 Thanks to Random House Inc. for the use of the cover image. It's been dreary weather for the past few days. Lots of rain, but don't get me wrong, we really needed the rain. Our grass had turned into a brown, crunchy mass a few weeks back. I can almost imagine it turning green already. 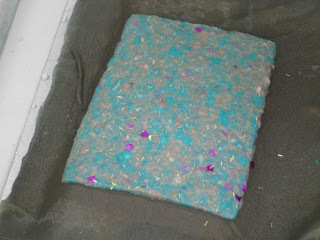 Up side is that it gives me more time inside working on my stitching. Last evening was the end of year meeting at my local quilt guild. For the past few years we have been making blocks for the outgoing president. This year she wanted black, white and red (same red as in our flag). We could select any pattern though it needed to measure 12 inches. The goal I set myself, if to find a block that no one else will make. 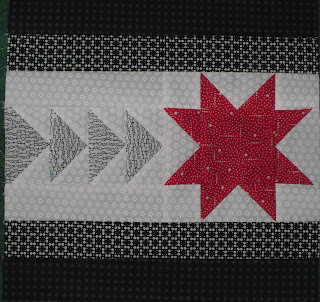 This year, I selected "Paul Revere's Ride" designed by Judy Martin from her book Knockout Blocks and Sampler Quilts. Click the link for my review and some additional photos. In July, during my vacation, I will have a post showing the rest of red, black and white blocks. They are stunning. 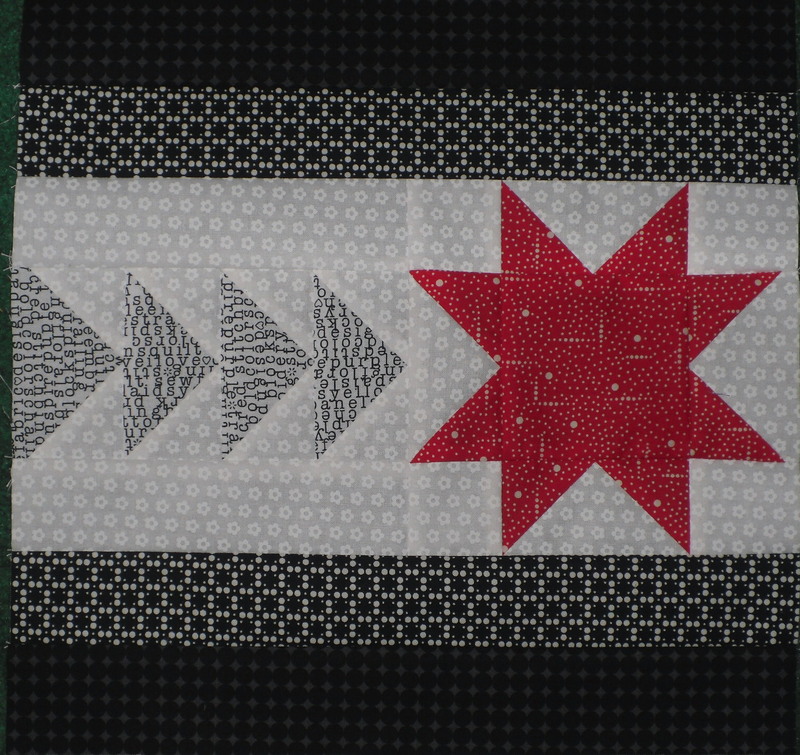 I'll write a second post and include photos of the quilts that our guild past presidents have made with their blocks. Yippee, I finished the quilting and binding on my mini sampler. The light was really weird today, so I had to go out on the deck to get this photo. 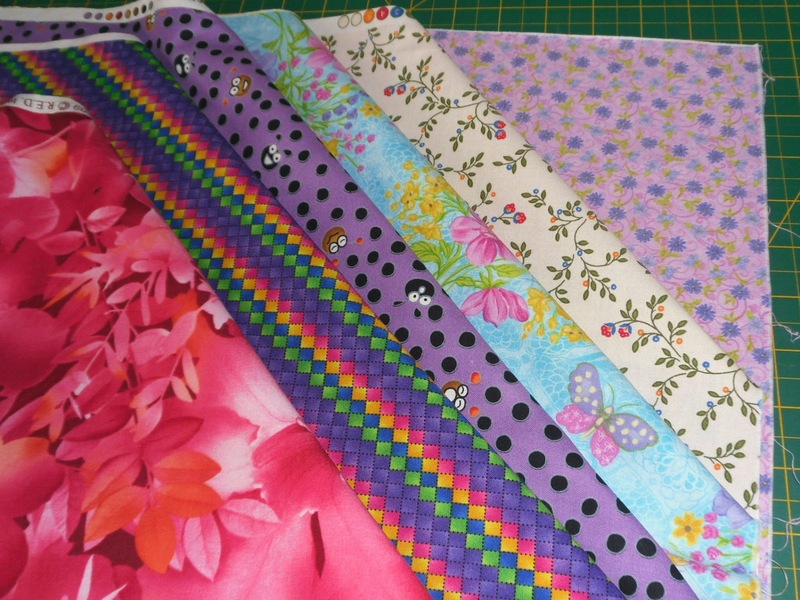 I used a 3 inch wide template to mark an over all quilting pattern. I offset and spaced the rows about 1/2 an inch I'm really pleased with how it turned out. I have asked my mother to machine and embroider the label and after I attach that, will give it to my dad. It's just a wee quilt, so dad can take it around the house to enjoy. We're waiting to see if this new treatment is effective with his multiple myeloma. Thanks to Joanne at Thread Head for the pattern. 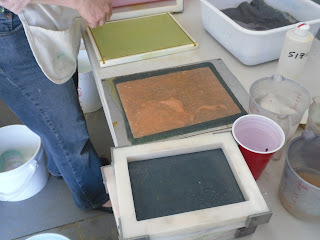 One project finishes and another begins. A few weeks ago I signed up for an ugly fabric swap. 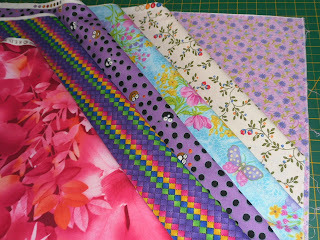 Called In the Bag - Ugly Fabric Quilt Challenge, several dozen participants were paired with other quilters and they exchanged two yards of fabric. 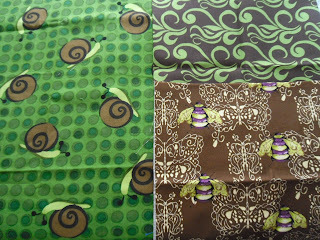 These are the fabrics that my partner Melissa sent to me. I love the snails. It's the florals that will be a challenge to me. I generally don't set out to buy florals; they are much too traditional for me. 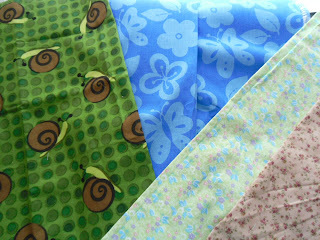 I was easily able to find some fabrics in my stash to work with those snails. In the fashion of the turtle and the hare, which will win the race, the snail or the bee? 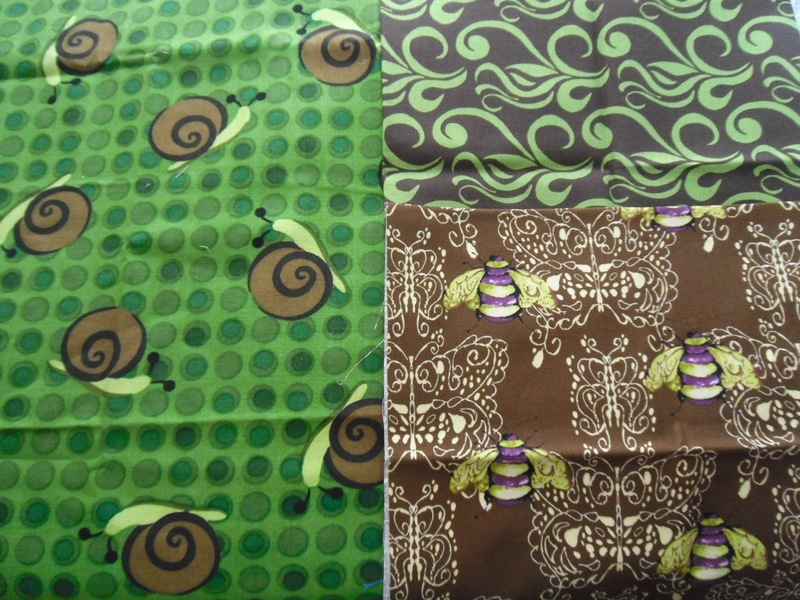 These are the fabrics that I sent to Melissa. I wanted to make them challenging without being too difficult. A bit of colour co-ordination but contrasting patterns. And of course, I had to send some of the florals that I wasn't planning on using. stay tuned for continuing updates on this project. I have till October to complete my project. 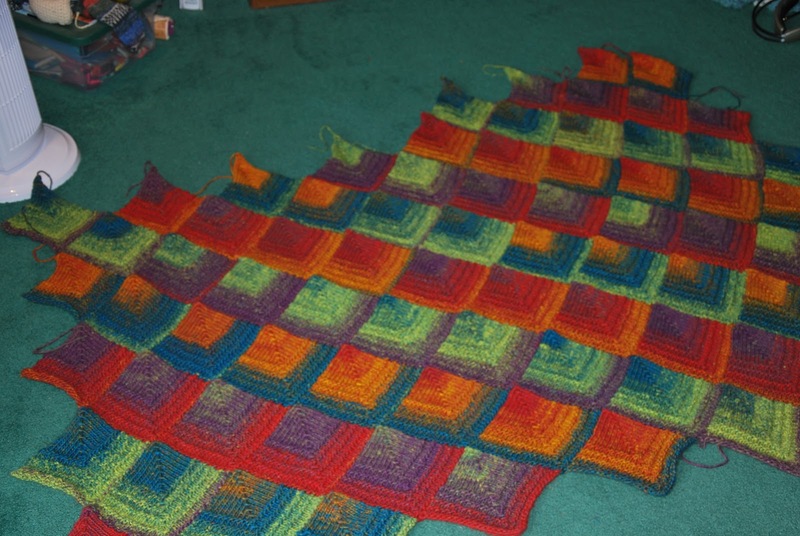 One more square to go and I'll be finished row 6. There are to be 15 rows in total. I do think it is going to need a round or two of crochet afterward. 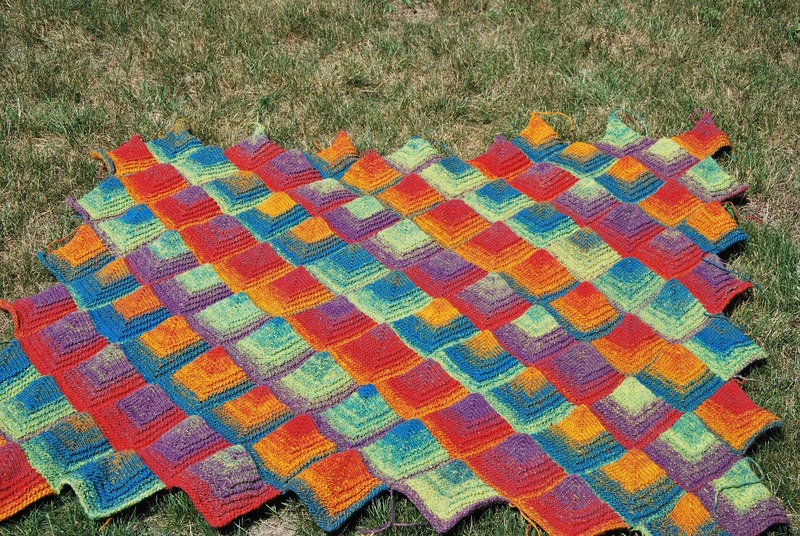 I've momentarily mis-placed the pattern, but I don't recall it including any instructions for finishing the edges. How did you do with your projects this past week? Finishes or did you start something new. 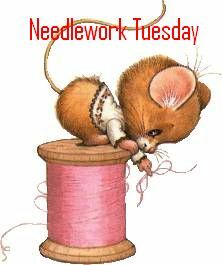 Please leave a comment and share your stitching. 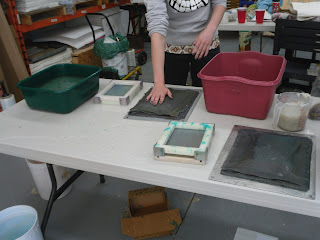 Jane had a wonderful time in Halifax with her gracious host Linda, from the blog Scrapmaster. 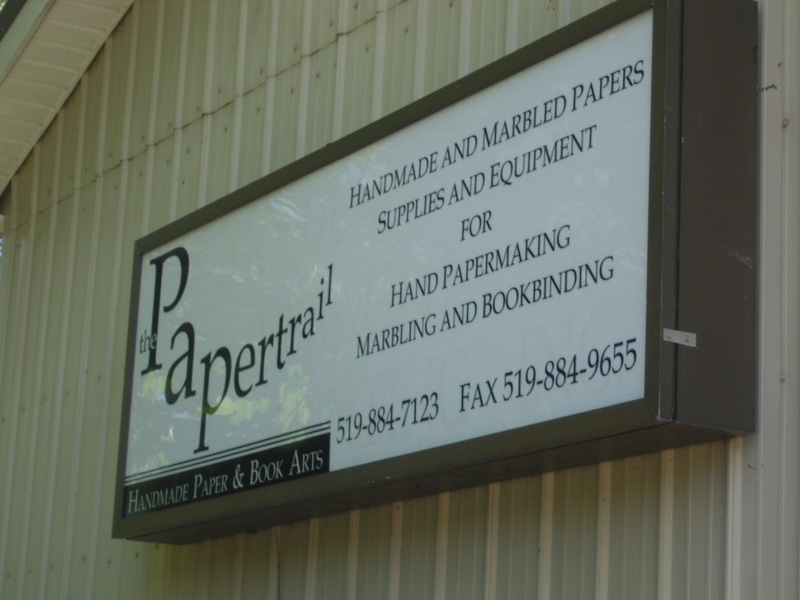 Linda has posted all sorts of photos of the two of them visiting Quilt Canada and photos of the numerous quilters that she was introduced to. Jane is ready to continue with her travels, but is in need of a host. Let me know if you would like to host Jane for a few days and show her around your part of the world.